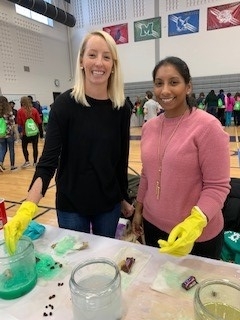 Young Women in Bio Philadelphia hosted a table at the GETT Expo at Phoenixville Area Middle School on March 23, 2019. Girls Exploring Tomorrow’s Technology (GETT) is an annual event in the spring for girls in grades 5-10 and their parents to learn more about career opportunities in a broad scope of STEM-related industries. The day is filled with exciting, enlightening and experiential workshops led by successful women in STEM fields. This year, GETT was attended by 957 students, 315 parents and educators, 73 volunteers, 32 STEM ambassadors, 121 Expo STEM Activities, and 67 organizations. YWIB Philadelphia hosted an experiment table where the girls came up to participate in a density experiment and talk about careers in STEM, and the parents learned about YWIB and Women In Bio (WIB). What is your title and company you work for? Finding someone their dream job is beyond rewarding and can re-direct their entire life. There is no better career as far as I am concerned. What's your role in WIB-Philly? Why did you join WIB? I arrived at my first WIB event last spring and was instantly inspired by the idea of a collective community supporting individual aspirations and goals. Women helping women! What is a hidden talent most people don't know you have? I know how to juggle. Not just figuratively (ie: raising three kids while helping run a company), but I literally know how to juggle and was a member of the juggling club in high school. 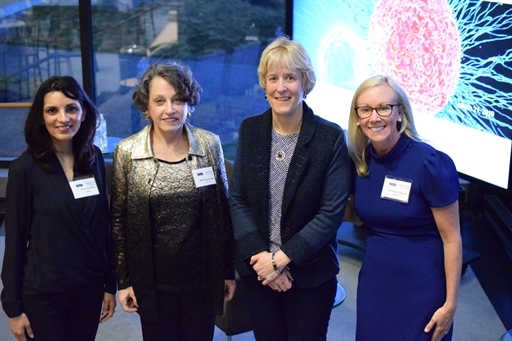 The WIB-Philadelphia Chapter honored three women who have helped set the stage and pave the way for the foundation and tremendous growth of the local Life Science industry in the Philadelphia Metro area. The speakers shared their stories, insights on trends in Philly’s Life Science community, challenges as an entrepreneur, and lessons learned. With cocktails and light bites, the event was held on Thursday March 21st 2019 at 5:30pm in the Navy Yard, at Adaptimmune's headquarters. The event was well attended and received with over 90 people registered. Moderator Kimberly Freeman is Vice President at Adapatimmune US, where she works in Commercial Strategy & Planning. Freeman has extensive oncology experience including R&D, New Product Planning, Marketing, Sales, and National Accounts. Her specialties are Oncology and National Accounts. Speaker Jane Hollingsworth founded and manages Militia Hill Ventures, an organization that creates and develops high growth, high value life sciences companies, and has successfully founded, financed, grown, managed, and taken public two biopharmaceutical companies. She has been a key senior management member of a fast growing, publicly-traded, multinational Clinical Research Organization (CRO). Hollingsworth co-founded and was CEO of NuPathe, a biopharmaceutical company focused on innovative solutions for diseases of the central nervous system, including neurological and psychiatric disorders. NuPathe was sold to Teva Pharmaceuticals in 2014. She was also Co-founder & EVP of Auxilium Pharmaceuticals, a biopharmaceutical company dedicated to providing innovative solutions for unique diseases that improve health and quality of life, which was sold to Endo Pharmaceuticals in 2015. Speaker Maria Maccecchini is one of Philadelphia Business Journal’s 2019 Power Women: 12 who are Having an Impact on Bioscience. She founded QR Pharma in May 2008 to develop better therapeutics for Alzheimer’s, Parkinson’s, and other neurodegenerative diseases. She was also partner and director of two angel groups: Robin Hood Ventures and MidAtlantic Angel Group; Founder and CEO of Symphony Pharmaceuticals/Annovis (a biotech company that sold in 2001 to Transgenomic); General Manager of Bachem Bioscience, the US subsidiary of Bachem AG, Switzerland and Head Molecular Biology Mallinckrodt. Dr. Maccecchini did one postdoc at Caltech and one at the Roche Institute of Immunology. Her PhD in biochemistry is from the Biocenter of Basel with a 2 year visiting fellowship at The Rockefeller University. Speaker Priya Buhtani is Founder & CEO RegDesk, a venture backed by IBC, Penn Medicine and DreamIt Ventures. RegDeskTM is the developer of a cutting-edge regulatory approval software solution. Its platform delivers regulatory intelligence to medical device and pharmaceutical companies that are ready to penetrate foreign markets. Its mission is to help life sciences companies reduce their time to market, eliminate the risks associated with penetrating new markets, maximize their product revenues and market share, and increase patient access to lifesaving medical devices and therapeutics. Working with such a great team of people and knowing that what we all do in Marketing is helping IPS get in front of our clients to help them bring life-impacting drugs to market faster. I am co-chair of the Sponsorship committee and also help to plan the IPS-sponsored events for WIB. Although I was recruited by Sue Behrens, WIB was an organization that I had been interested in beforehand. My hidden talent is that I’m a professional singer in Philadelphia who sings opera, musical theatre, and sings with the Philly Pops orchestra. Recently, one of my singing bucket list goals was achieved when I was asked contracted to sing in Sarah Brightman’s World Tour stop here in Philadelphia as one of her backup singers! WIB-Philadelphia: WIB Philly Has Tremendous Turnout for Its First Event of 2019! On February 21, 2019, WIB-Philadelphia Metro started off the year with a splash by holding its largest event yet, thanks to host and sponsor: IPS-Integrated Project Services. Approximately 80 ladies attended the event in Blue Bell, Pennsylvania and enjoyed light hors d'oeuvres and drinks while networking and learning about WIB-Philadephia.Thanks to Blue Bell Inn for providing a very generous gift card as raffle prize for the event! Overall, it was a fantastic start to 2019, which promises to be our best year yet!